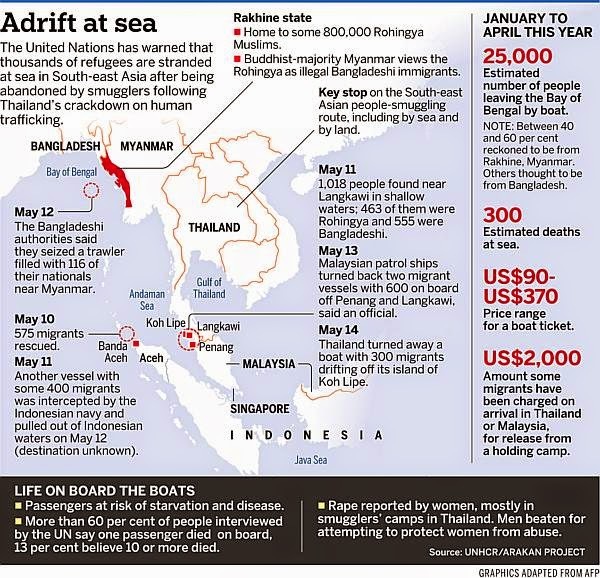 Some of those who are adrift in the Andaman Sea have been provided with food, water and medicine by the Thai navy. It is not clear how many other boats are in a similar predicament. 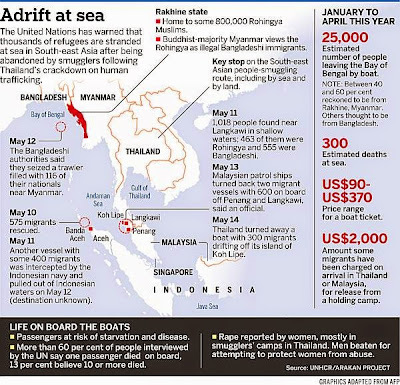 Some boats containing migrants have been towed over to the Malaysian side of the border - where most migrants want to go - only to be taken back into Thai waters. "No-one wants them," the BBC's Jonathan Head says, and seeing them off the southern coast of Thailand, near Koh Lipe, that it is a "desperate sight" as they beg for food and water. On one crowded vessel with a lot of women and children on board, our correspondent saw people drinking their own urine from bottles. The migrants - including 50 women and 84 children - said they had been at sea for three months.